Bacup Borough 4 Holker Old Boys 1, 25/04/2016. 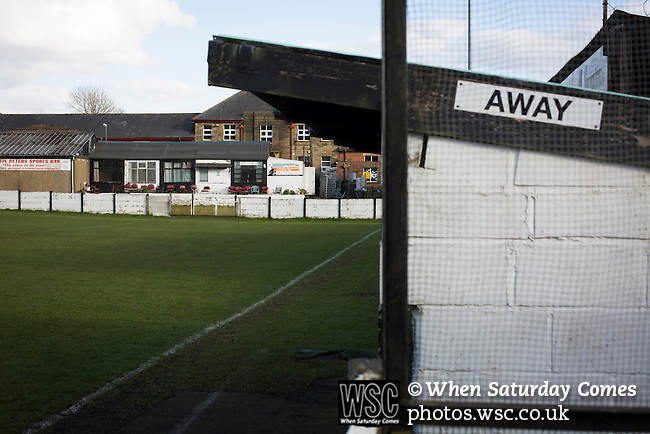 Brain Boys West View Stadium, NorthWest Counties League Division One. The away dugout and Martin Peters Social Club at the Brain Boys West View Stadium before Bacup Borough play Holker Old Boys in a NorthWest Counties League division one fixture. Formed as Bacup in 1879, the club moved into their current home in 1889 and have been known as Bacup Borough since the 1920s, apart from a brief recent spell when they added the name Rossendale to their name. With both teams challenging for play-off places, Bacup Borough won this fixture by 4-1, watched by a crowd of 50. Photo by Colin McPherson.